Few things are as precious to an artist as his or her artwork. We all want the fruits of our creative output to remain safe, secure, and organized—kind of like our children! However, keeping everything in the studio—our art supplies, artwork, cleaning products, and empty pizza boxes—neat and tidy can be almost as big a challenge as raising a child (almost!). Luckily, you're not alone! Artists have been perfecting ways to stay organized for generations, and, just as with their artwork, we benefit from their experimentation. MisterArt.com has all the materials you need to keep to keep your workspace safe, clean, and tidy while saving you money at the same time. Yes, we're a very compassionate company! Storing airbrush paints is a crucial endeavor: paints that are drying out won't spray properly and can foul up the innards of your airbrush! Proper storage of paints is a real priority to ensure that they stay fresh. Airbrush paint storage bottles are great for storing paint when you've mixed a little too much. Packing excess paint away beats dumping it down the drain any day! Unintentional rhymes aside, though, glass storage bottles with secure, screw-on lids are the best way to keep your stock of airbrush paint fresh and ready to use at a moment's notice. These clear vessels are easy to clean and make using multiple colors with one airbrush fast and easy. MisterArt.com also carries glass bottles with gaskets and lids that are sold separately. These supplies allow for the convenient replacement of only the parts that you need. The bottles are made of thick, hard-to-break glass; lids are metal with an enamel finish. The gaskets are cork, the preferred material for liquid storage. In addition to keeping paint in good working condition, these airbrush storage bottles make switching out different colors of paint a simple, painless affair. Caddies are desktop organizers designed to help artists keep track of their myriad pens, pencils, markers, knives, and brushes. Using a system of slots and niches, caddies keep painting and illustration supplies upright, eliminating the danger of having them bent, broken, dried out, or lost. Caddies are simple tools, but they're also far more effective and attractive than leaving your art supplies scattered on a table top or crammed into cups and shoeboxes. The two most popular kinds of caddies are differentiated by their shape: round carousel caddies and cubical box caddies. Carousel caddies, typically constructed of plastic, have the advantage of being able to spin, making it a snap to find and retrieve any pen, marker, or brush stored on your desktop. Wooden box caddies, on the other hand, feature larger compartments that are great for storing and organizing large numbers of art supplies. Supplies that are bigger than the average pen or marker also find a better fit in these caddies. MisterArt.com has everyday discounts on art caddies and many more art supplies online! Filing solutions allow artists to safely store paper documents and artwork. By filing them away, artists can be sure their important work will be easy to find and undamaged. There are a number of different kinds of filing solutions that are suited to different sizes and textures of paper. Roll files, for example, are compartmented, basket-like filing systems designed to store large, rolled-up documents and art. Vertical hanging files keep papers flat and easy to search through quickly. Flat files use large, shallow drawers to store stacks of art paper flat and free from wrinkles. Still other filing solutions provide different advantages. Drop front storage boxes are rigid enough to prevent the papers within from being crushed. Storage folders and art portfolios keep work safe as it is being perused or transported. No matter what kind of filing solution best suits your needs, you'll enjoy fast shipping and unbeatable prices at MisterArt.com! Effective paint storage is an important element of making painting a cost-effective enterprise. Most artists have felt the frustration of discovering that their paints have dried up or spilled. By utilizing storage vessels, however, we can limit and even eliminate these annoyances! Plastic jars and bottles are great for storing paint for several reasons: they're airtight, difficult to break, and (best of all) cheap! These hermetic containers can keep paint fresh indefinitely. Reusable paint cups can also be easily cleaned with brush cleaner or odorless paint thinner, depending on the paint being stored inside. MisterArt.com stocks a vast selection of paint storage cups and jars in many shapes and colors. If you'd rather your paint was a bit easier to transfer from storage to your palette, we offer discounted squirt bottles, too! Our favorite paint brushes are precious, trusted tools and friends. When properly cared for, these often-delicate instruments can last for decades! But because the bristles of paint brushes can be pretty fragile, different circumstances call for different methods of paint brush storage. When brushes aren't in use, a spinning brush caddie is a great choice for keeping brushes dry and organized on top of a desk, cabinet, or studio table. Some artists prefer to keep their brushes stored flat to conserve space; wooden brush boxes and brush cases keep paint brushes safe, clean, and together within an attractive, sturdy shell. Toting paint brushes around can be a trickier proposition, but MisterArt.com has you covered! Leather and fabric brush bags are great for stashing a large selection of brushes safely while on the go. For a smaller group of paint brushes, many artists prefer roll-up brush mats, constructed from materials such as canvas and the more traditional bamboo. But what about the storage of paint brushes while they're in use? For this purpose, nothing beats a nice porcelain or ceramic brush holder. This comb-like device keeps your wet brush heads suspended while they lie on your desk or palette, ensuring that they dry evenly and avoid staining materials underneath. No matter what sort of storage materials best suit your needs, you can buy cheap paint brush supplies 24/7 at MisterArt.com! Artists that work frequently with pens, pencils, and markers know all too well that these art supplies are prone to getting lost, breaking, and drying out. Proper pen, pencil, and marker storage is a necessity for keeping them in good working condition. Luckily, MisterArt.com offers many different storage options online! Caddies are the perfect option for storing pens, pencils, and markers on top of a desk or drawing table so that each different color can be easily located and accessed. Storage boxes, with their durability and rigidity, keep pens, pencils, and markers safe from damage and free from dust, dirt, and spills. Some storage boxes have handles, making it a snap to carry your pens, pencils, or markers anywhere you need them. Art bags are similar to storage boxes, but because they are not rigid, they can expand and collapse when needed in order to comfortably fit many art supplies or only a few without wasting space. When pens, pencils, and markers are all stored together in an art bag, they'll never get lost! Chests are great for organizing large numbers of pens, pencils, and markers. Use separate drawers for different sizes, colors, or brands of your favorite art supplies and they'll be kept safe and cool. Members of MisterArt.com's VIP Savings Club have access to deep discounts of up to 75 percent and more off of storage solutions and other art supplies every day! What good are your photographs if you can't show them off? Whether you're mounting them for framing or sticking them in a scrapbook or album, proper photography storage and care can ensure that your photos will be around for you to enjoy and share for years to come. Adhesives allow you to mount your photos on to the pages of a scrapbook or onto mounting board for matting and framing. Hinges and photo corners are also great for mounting, without the potential mess or permanence of an adhesive. Laminating film can protect your photos from the ravages of time, the elements, and rough handling. Photo books and albums allow artists to display and store their favorite photos safely and take them anywhere. You can find everyday discounts on these photo storage supplies and many more at MisterArt.com! Scrappers face unique challenges in storing their art materials—specifically, the volume! Scrappers must organize and keep track of cutting tools, books, papers, markers, stickers, adhesives, glitter, and more in order to document their memories efficiently. Studio organizers, with their shelves and drawers, are great for storing tools and papers. Organizers come in many different sizes and designs, from massive shelving units to compact chests on wheels. Keep all of your scrapbook supplies organized and easy to find! Tote bags are a handy way to throw a lot of supplies together before hitting the road. These versatile carriers can be used to store a variety of cutting tools, adhesives, scissors, envelopes, and paper, keeping everything safe and clean as you travel. Storage boxes contain many different compartments in which to stow away scrapbooking supplies of all sizes and shapes. From tiny bottles of glitter to giant pairs of scissors, these rigid carrying cases keep your art supplies separate and secure. Storage folders keep paper, completed pages, magazines, photos, and other flat scrapbook supplies smooth, safe, and wrinkle-free. Label each folder to make sorting through their contents a snap. When it comes to getting your supplies organized, there are plenty of different furniture pieces to choose from. Some studio organizers are specialized, designed for a specific purpose. Print racks and pastel chests, for example, are intended to organize specific art supplies, namely prints and pastels. With a little research, you may discover that there is a specialized piece of art furniture designed to organize exactly what you'd like. Other furniture might be good for many different uses. Taborets and cabinets come in many different shapes and sizes and can hold a wide variety of supplies, from paintbrushes to pencils to paper. Before making a decision on what studio organizer is best for you, it's a good idea to take careful stock of how much space you have available and what sort of art or supplies you'd like your organizer to hold. Tool bins and sketch boxes are a great solution for keeping art supplies safe, dry, organized, and portable. These rigid, rugged boxes often are divided into many different compartments of various sizes, allowing for organization of an artist's supplies into neat groupings. Storage boxes come in a wide variety of sizes and shapes in order to store the myriad kinds of art supplies that artists need to protect and carry. Paints, brushes, pencils, pastels, inks… there's room for all of them inside a good tool bin. Plastic tool bins are the most common and the lightest storage and travel boxes. These bins often resemble fishing tackle or makeup boxes in that they have many different shelves, doors, and compartments in which to stow away supplies. These are great for grabbing all of your art supplies quickly when you're on the go. Wooden boxes and bins are perhaps the most decorative that are available. Often stained nicely, these storage bins are as attractive as they are useful. Metal storage boxes are the sturdiest and most resilient bins available. Most metal bins come lined with foam in order to protect the art supplies stored inside. These are ideal for fragile art tools such as pastels. 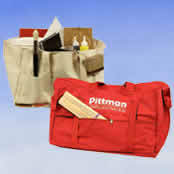 You can find the best selection of tool bins and sketch boxes online at MisterArt.com! Caddies are the perfect option for storing pens, pencils, and markers on top of a desk or drawing table where each different color can be easily located and accessed. Hold everything along with your imagination! Securely holds pencils and brushes.